Goodreads Summary: A haunted house, a buried mystery, and a very angry ghost make this one unforgettable thriller. I really enjoyed Kim Harrington's first two books, Clarity and Perception. Her books are fun, quick reads that draw you into the mystery and keep you hooked until you've solved it, and The Dead and Buried was no exception. Jade has always wanted to move to a big city and escape her small town. When her dad and stepmother tell her that they're finally moving, she's thrilled. She even likes their new house - until she learns it's haunted. Her little brother sees a strange girl in his room, and it doesn't take Jade long to learn that it was a girl from her new high school who died last year. Jade is charged with finding her murderer, but the task isn't easy. Many people had motive, and it's hard for her to concentrate with one guy drawing her attention and another trying to draw it away. But the longer Jade takes, the more things there are at stake. Can she figure out who murdered Kayla and keep her house, her family, and her new life safe? The Dead and Buried is one of those books that hooks you right away. I liked Jade from the beginning, both from seeing how she took such good care of her brother and from watching her defy social conventions when she started her new high school. She befriends one of the unpopular girls, catches the eye of the most popular guy, and finds herself drawn to Donovan, the shy artist who is clearly hiding something. Donovan was a character that I wanted to know more about, and one that I couldn't help but sympathize with. Then there was Kayla. Even though I liked seeing her diary entries to know what was going on inside her head, I have to say that it's a shame there wasn't much of anything redeemable about her, either as a human or a ghost. However, in a way her calculating nature made her intriguing. There was another aspect to this book, and that was Jade's collection of gems. I really enjoyed learning what all of the different gemstones and what they meant. Beyond that, the mystery of the book was fairly easy to solve, but there were so many other aspects to the story that I was never bored. In fact, I wish the book could have lasted longer just to spend more time with the characters. If you're looking for a mystery with depth to the characters, look no farther than The Dead and Buried. 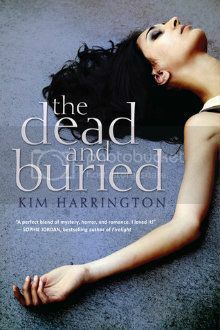 I'll look forward to seeing what Kim Harrington writes next! Also, if you've read the book already, or if you want a better idea of the characters, check out this fantasy casting post.